If you're in the area, we invite you to visit with us. 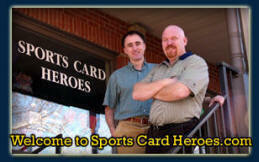 Sports Card Heroes is located in Laurel, Maryland. Our store hours are Monday - Saturday 10am - 7pm. We are closed on Sunday. We gladly accept VISA, MasterCard, Discover, American Express, Personal Checks, & Money Orders for your purchases. All of the autographed items that we offer for sale on our web site have been signed here, in our store, during a signing event, or at a local show which we attended and had signed in our presence. This way, you can have the utmost confidence in the authenticity of any autographed item you purchase from us. Our unique visitors since November 2005 We thank you for your visit!